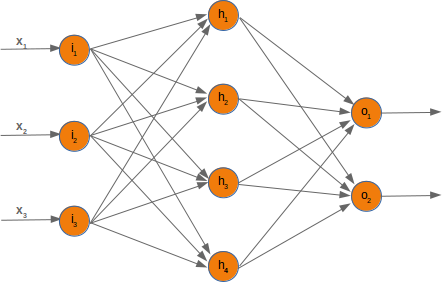 We have introduced the basic ideas about neuronal networks in the previous chapter of our tutorial. We pointed out the similarity between neurons and neural networks in biology. We also introduced very small articial neural networks and introduced decision boundaries and the XOR problem. The focus in our previous chapter had not been on efficiency. We will introduce a Neural Network class in Python in this chapter, which will use the powerful and efficient data structures of Numpy. This way, we get a more efficient network than in our previous chapter. 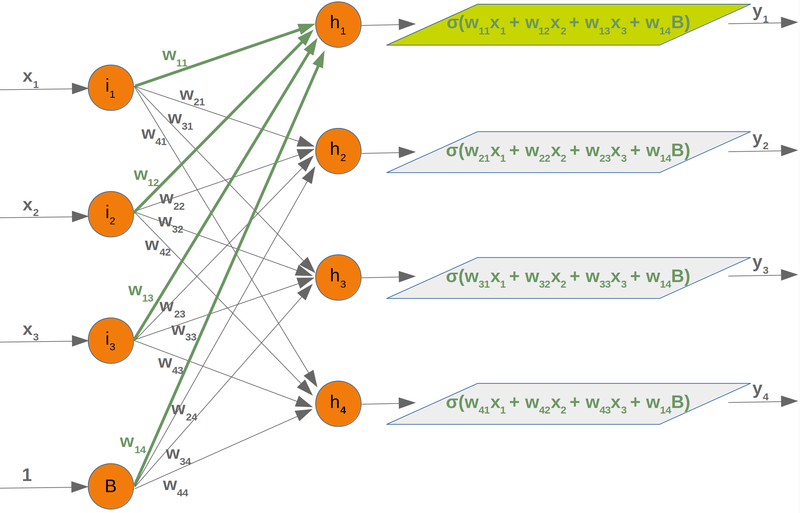 When we say "more efficient", we do not mean that the artificial neural networks encountered in this chaper of our tutorial are efficient and ready for real life usage. They are still quite slow compared to implementations from sklearn for example. The focus is to implement a very basic neural network and by doing this explaining the basic ideas. We want to demonstrate simple and easy to grasp networks. Ideas like how the signal flow inside of a network works, how to implement weights. how to initialize weight matrices or what activation functions can be used. 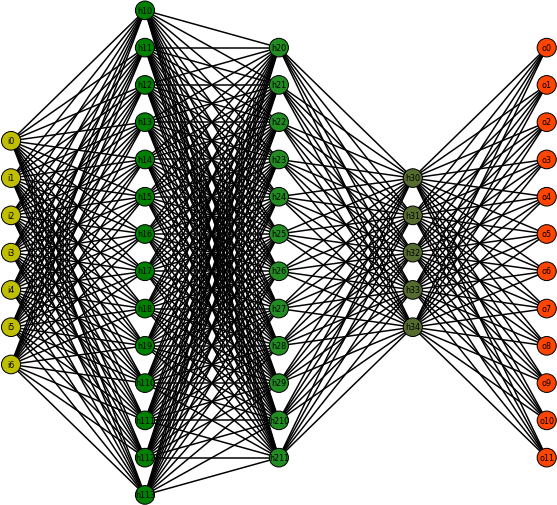 We will start with a simple neural networks consisting of three layers, i.e. the input layer, a hidden layer and an output layer. We have to note that some would call this a two layer network, because they don't count the inputs as a layer. Each of the arrows in our network diagram has an associated weight value. We will only look at the arrows between the input and the output layer now. Now that we have defined our weight matrices, we have to take the next step. We have to multiply the matrix wih the input vector. Btw. this is exactly what we have manually done in our previous example. You might have noticed that something is missing in our previous calculations. We showed in our introductory chapter Neural Networks from Scratch in Python that we have to apply an activation or step function $\Phi$ on each of these sums. The following picture depicts the whole flow of calculation, i.e. the matrix multiplication and the succeeding multiplication. The matrix multiplication between the matrix wih and the matrix of the values of the input nodes $x_1, x_2, x_3$ calculates the output which will be passed to the activation function. One of the important choices which have to be made before training a neural network consists in initializing the weight matrices. We don't know anything about the possible weight, when we start. So, we could start with arbitrary values? We can easily see that it would not be a good idea to set all the weight values to 0, because in this case the result of this summation will always be zero. This means that our network will be incapable of learning. This is the worst choice, but initializing a weight matrix to ones is also a bad choice. The values for the weight matrices should be chosen randomly and not arbitrarily. By choosing a random normal distribution we have broken possible symmetric situations, which are bad for the learning process. There are various ways to initialize the weight matrices randomly. The first one we will introduce is the unity function from numpy.random. It creates samples which are uniformly distributed over the half-open interval [low, high), which means that low is included and high is excluded. Each value within the given interval is equally likely to be drawn by 'uniform'. We like to create random numbers with a normal distribution, but the numbers have to be bounded. This is not the case with np.random.normal(), because it doesn't offer any bound parameter. We can use truncnorm from scipy.stats for this purpose. where n denotes the number of input nodes. rad = 1 / np.sqrt(no_of_hidden_nodes)  # this is the input in this layer! Running our neural network on some input means that we will have a matrix multiplications of the weight vectors and the inputs. We have to apply an activation function on the output values. 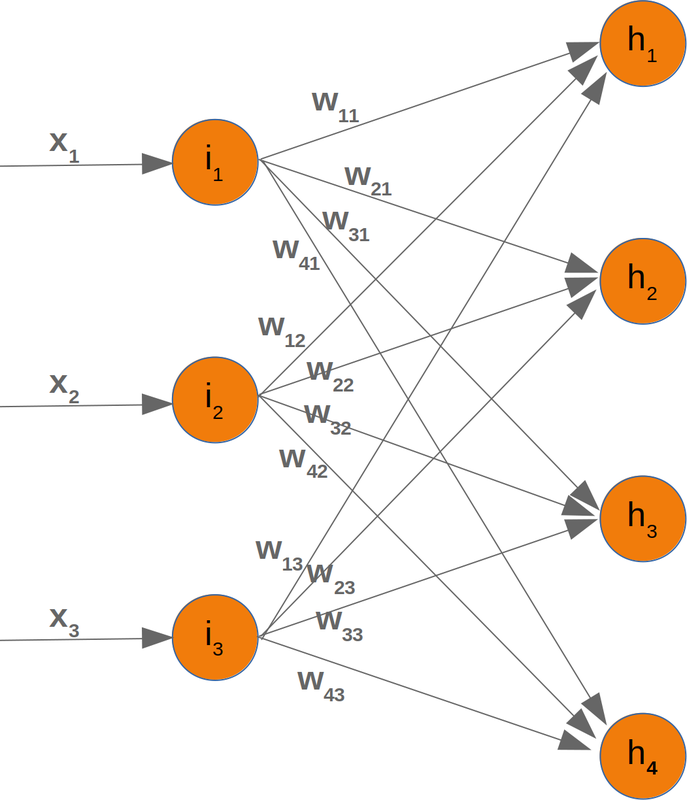 There are lots of different activation functions used in neural networks. The sigmoid function belongs to the most often used activation functions. Instead of defining the sigmoid function ourselves, we can use the expit function from scipy.special, which is an implementation of the sigmoid function. It can be applied on various data classes like int, float, list, numpy,ndarray and so on. The result is an ndarray of the same shape as the input data x.
running the network with an input vector input_vector. A bias node is a node that is always returning the same output. In other words: It is a node which is not depending on some input and it does not have any input. The value of a bias node is often set to one, but it can be other values as well. Except 0 which doesn't make sense. 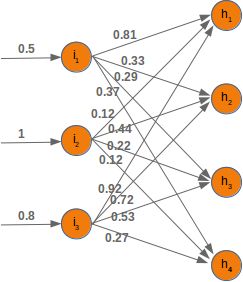 If a neural network does not have a bias node in a given layer, it will not be able to produce output in the next layer that differs from 0 when the feature values are 0. Generally speaking, we can say that bias nodes are used to increase the flexibility of the network to fit the data. Usually, there will be not more than one bias node per layer. The only exception is the output layer, because it makes no sense to add a bias node to this layer. network with optional bias nodes"""
x = np.dot(tmp, input_vector.T)[:-1,:]     # ???? last element cut off, ?? ?